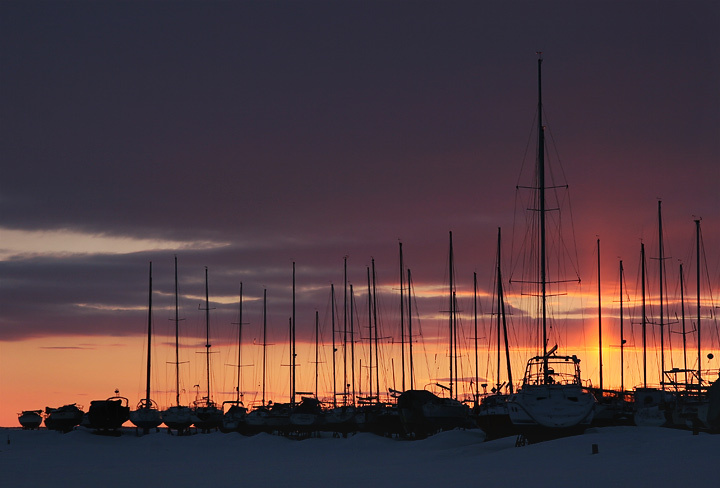 Sailboats awaiting the sailing season (the shortest of the two) on the grounds of the marina in Salaberry-de-Valleyfield, QC, Canada. Compositionally, this is a wonderfully done picture. It has a good balance from top to bottom, as well as from left to right. You don't have a lot of foreground, and that helps to emphasize the strong verticals of the masts (right word?) and the nice sunset. Technically, I also think it is well done. The colors are warm and rich, and the focus is very good. What might have hurt a bit is monitors that are a bit dark. On mine, I can the snow, etc. but it could easily be seen as a silhouette which takes away the harshness of it. Also, while it is a well done picture, and I think it does fit the challenge, (I scored it a 7, initially) I can't help but wonder if it didn't look "harsh" enough for some people. It is a beautiful sunset/rise and doesn't scream "harsh," I think. Proudly hosted by Sargasso Networks. Current Server Time: 04/22/2019 08:05:27 PM EDT.